I first got to take a peak at the Wilton Giant Gummy bear at the Wilton Mom ReTreat that I attended last month. I loved the idea and couldn’t wait to see more! 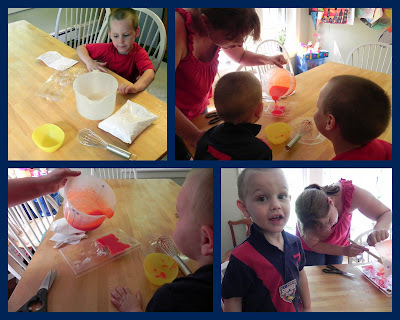 They demonstrated the entire method of making on with the Wilton Gummy Kit. I also loved that you could use the mold and make it in chocolate as well! I could not wait to try this at home! Our kit arrived and my boyz couldn’t wait to make it. The other night I made it with some very excited onlookers. It is really easy to do! Basically you whisk the mix with hot water and pour. You set aside the excess for later (that will be your glue to hold it together) and then refrigerate it. Not hard at all. After two to three hours you can unmold it and assemble. We waited overnight and made our gummy the next day. 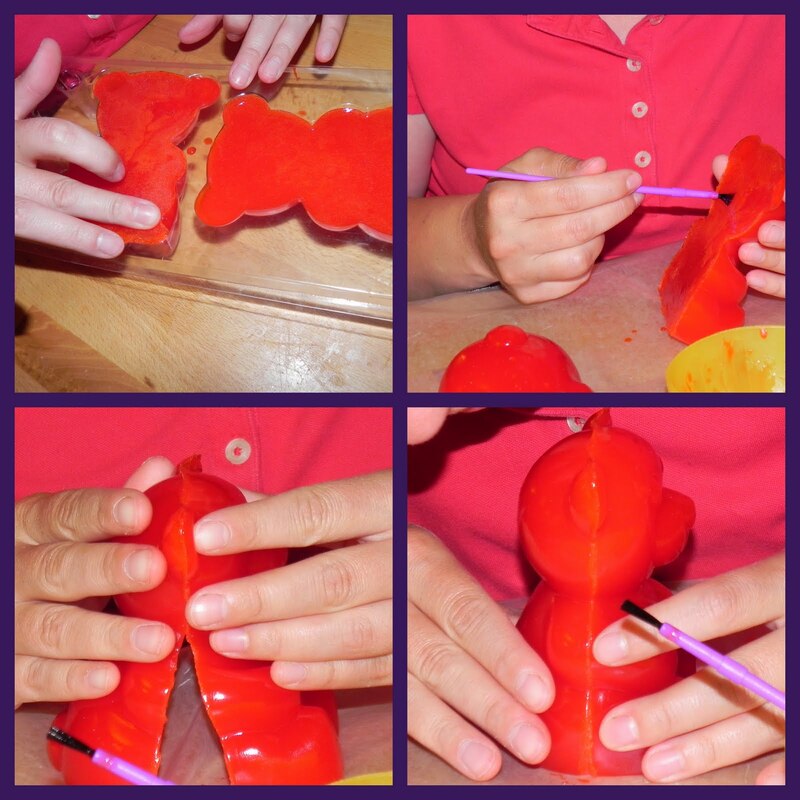 Before pulling it completely out of the mold be sure to gently pull it away from the sides a bit. When the two halves of the bear are out of the mold, use the excess of the mix (warmed for a few seconds in the microwave) and paint it onto one half of the bear. Then just press the sides together. I started at the top where the delicate features like the ears would be easiest to line up. All done! I had some very eager testers! It was a big hit! And speaking of big, it took us several days to eat our Giant Gummy. The Wilton Giant Gummy Kit is sold exclusively at Wilton.com. The kit includes a 10 oz. artificially cherry-flavored mix, large gummy mold and complete instructions. A Refill Kit is also available with includes two 10 oz. mixes and complete instructions. Both retail for $12 and have no shipping charges! 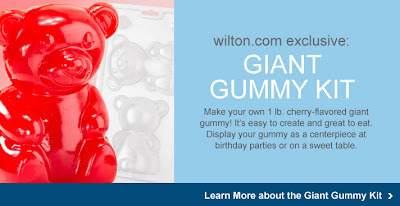 I am giving away a Wilton Giant Gummy Kit! To enter to win this Wilton Giveaway please visit the Wilton website and tell me what other Wilton product you’d love to try. Come back and comment here. This must be done first, or no other entries will count.Please be sure that your profile has your email right on it, or be sure to leave your email address in your comment. This contest is open to US residents only. 1. Like Wilton on Facebook and leave a comment back here for another entry. 2. Follow Wilton on Twitter and leave a comment back here for an additional entry. 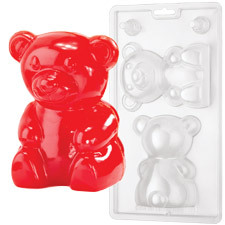 The Wilton Giant Gummy Kit Giveaway will end at 11:59 PM on July 25th. As a Wilton Mom Ambassador my travel was provided to see and learn about new Wilton products. I also received the items pictured here without charge. All opinions expressed are my own. I visited the Wilton website and would like to try the paw print cake pan – it is our school's mascot/logo and how fun would it be to have those paw prints for class parties, etc. I would love to have a cake leveler! My cakes always come out with big mounds in the middle! I like the Wiltons 101 Dalmatians shaped cake pan. I'd like the Heart Cookie Treat Pan. Thanks. since we moved I cant find my piping bag and tips for the life of me and a ziplock just inst cutting it lol so Im gonna have to get some more from wilton! I like the Animals Cookie Candy Mold. would love to have the giant cupcake pan! I would love to try the Jungle Pals Pretzel Molds! They look like something that my great nieces and nephew would enjoy making and eating. My son would love a cake made with the Dump Truck Pan. I would like to try the ready-to-go decorating icing they make. haven't had a chance yet. I like the giant cupcake pan. I'd love to try the Elephant Cake Pan. Following @WiltonCakes on Twitter @hle123. I like the butterfly pan! This would be so neat for my daughter's birthday! I would also love to have the Sundae Surprise Candy kit! I like Wilton on Facebook user Lisa Garner. I'm following Wilton on Twitter @lisalmg. Ii would love to try to make the victory lap cake. I'd like to try the Punch.Cut.Decorate! I would also love to try the 3d egg pan set. I’ve been wanting their Cupcakes ‘N More® 23 Count Standard Dessert Stand for a while now. We always have neighborhood parties where we make cupcakes and let the kids decorate them, and this would be so great for that. I like the Teddy Bear Stackable Cookie Cutters. I would like to try the Cupcake Fun Book and see what kinds of stuff the kids and I can do. We love Halloween so i think the Silicone Mini Spiders & Webs Mold is cute.Thanks!! I would also love the giant cupcake pan! The thing that I would like the most is the Baseball Mitt Pan. I love the mickey mouse cake pan! i'd love to try the punch.cut.decorate! products – wilton always comes up with the best ideas! how neat! i like wilton on fb! i follow wilton on twitter! I would love the 3D Ducky cake pan, thanks! I'd like the heart cookie treat pans!